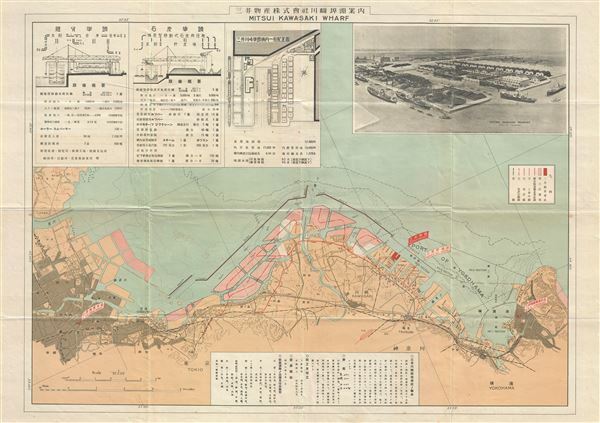 This is a scarce 1928 or Showa 3 Japanese bi-lingual map or plan of the Mitsui Kawasaki Wharf. It covers the region from Tokyo to Yokohama in great detail and notes roads, rivers, towns, railways, ports and a host of other details. Kawasaki, located between Tokyo and Yokohama Cities, is the 9th most populous cities in Japan. This map notes the locations of the M.B.K. Head Office, M.B.K. Yokohama, the Mitsui Oil Depot and the Mitsui Wharf in red. The top left quadrant of the map details three plans while a black and white photograph of the Mitsui Kawasaki Wharves â€' Port of Yokohama is featured in the top right quadrant. Text is in English and Japanese. Very good. Minor wear and creasing along original fold lines.